Alex Stone, a Brookhaven Student’s, jewelry business, Nettle Heart Creations, sells unique jewelry made out of natural materials, such as copper, feathers and bones. 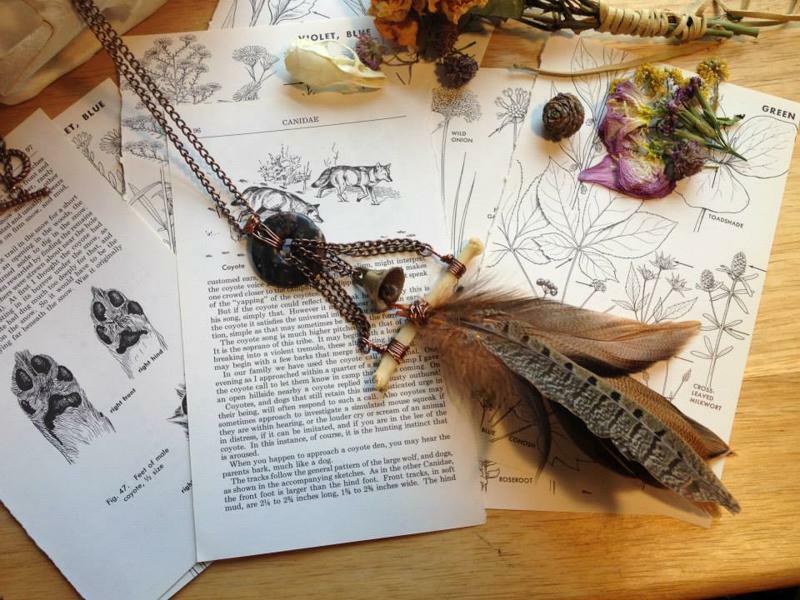 “The Carrion Caller” is a necklace made with a marble finding, brass chain, an antique brass bell, a scavenged coyote foot bone and pheasant feathers. It was created by Alex Stone, a Brookhaven College student. A marriage connected by art, successfully runs the creative jewelry business, Nettle Heart Creations. Alex Stone, a Brookhaven College student, works as a full-time student and entrepreneur with her wife, Maggie Stone, to create complex, natural jewelry pieces. About three years ago, an old friend of Alex’s contacted the couple requesting help for the Annual Native American Championship Pow Wow that takes place at Traders Village. “This annual event is a great time to visit with old friends and make new ones,” according to tradersvillage. com. And that is exactly what Alex and Maggie did – they made a new friend. John Beecroft is a well-known bowmaker who creates Native American crafts and jewelry and sells stones. Over time, the couple became good friends with Beecroft. Alex said Beecroft saw their potential and told them he thought they could start a small business making their own jewelry. “We’re both artistically minded, and I think that’s something that’s always drawn us together because we’ve always bonded over various forms of art,” Alex said. Maggie said she has always been interested in art. Maggie and Alex Stone co-own Nettle Heart Creation. “If I can put my hands on it, I’ll learn it,” Maggie said. She was gifted some wires and tools and started to learn. She said everything made sense after a friend taught her the basics of wire wrapping. Alex said she first started making jewelry as a young child, when her aunt showed her how to make friendship bracelets. She said she stopped for some time to pursue other interests but picked the craft up again in her 20s. When Maggie and Alex became a couple, they had varying interests. Their fateful encounter with Beecroft brought the couple’s interests closer together, and Nettle Heart Creations was formed. The name is derived from the physical manifestation of the nettle plant, which is prickly and often thought of as protective. Alex said Nettle Heart implies the couple protects things close to their hearts, such as art and each other. Traders Village is not the only place Nettle Heart Creations sells its wares. Alex and Maggie sell their merchandise across the country when they travel to different fairs and festivals. 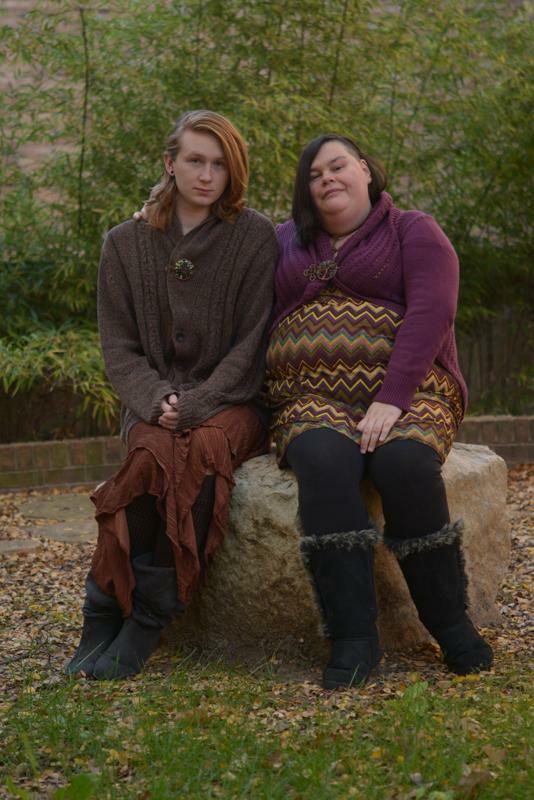 In April 2014, Alex and Maggie attended the Heavener Runestone Viking Festival and camped outside for 12 days straight. “Sol” is a necklace pendant made with copper wire, freshwater pearls and a tiger iron focal, created by Maggie Stone. Alex said the couple slept under the stars with thunderstorms rolling across the skies, bats flying overhead and coyotes singing on the other side of the ridge. 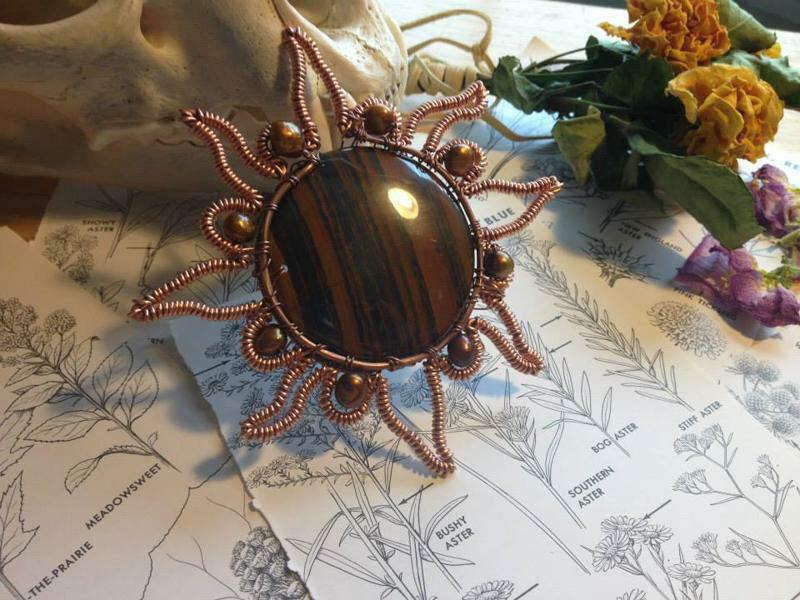 They sat in their tent embracing the sights and sounds of nature as they crafted jewelry. 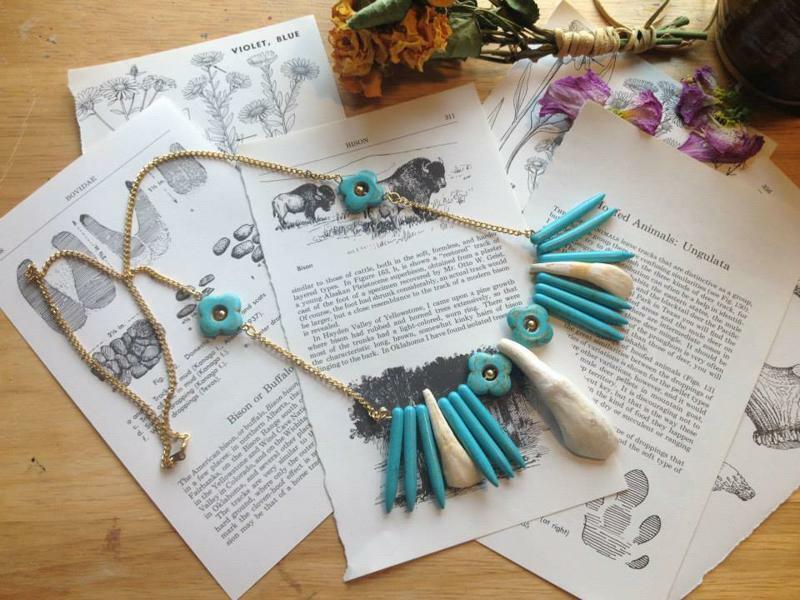 The trip solidified their style, which uses mostly natural materials, such as feathers, animal bones, pearls, wood, leather, shells, beads and more. Maggie said the rule of thumb, when selling at their table, is if their jewelry looks like part of an animal, it is. Maggie said Nettle Heart Creations uses recycled materials, such as animal bones or teeth, because it is like giving the animal a second life. Alex said she practices earthbased spirituality and considers animals very sacred. Maggie said a lot of the materials they use are byproducts of trade, so Alex and Maggie make sure to buy those items so they can be reused and nothing is wasted. The couple largely works with natural materials but also loves working with copper. Alex said copper has natural earth tones, smells earthy and fits with the other natural materials. If intense heat is applied to copper, the metal turns various shades of green, black and brown. “Lovestruck” is a necklace pendant made with silver wire, rose quartz and glass, created by Maggie Stone. “And the older it gets, the more beautiful it [becomes],” Maggie said. Alex and Maggie said inspiration for their creations comes freely, and they sketch out the designs first. They both make jewelry and do their work at home, friends’ houses, parks and anywhere that is accessible. Maggie tends to work on the metal jewelry more, and Alex works more on crafting large, ornate necklaces. Alex also makes flower crowns, which she sold at QueerBomb Dallas, a rally celebrating the LGBT community. Nettle Heart Creations also occasionally sells jewelry at The Green Elephant, a bar located in Dallas. Alex and Maggie appear at Renaissance fairs and festivals, Traders Village and local pride events. Alex said she will set up a booth at the Brookhaven Holiday Market Dec. 8.